Hint Messages appear at key points during the game. Gameplay hints and important objectives are displayed. At the beginning screen of each mission, the Mission title and the Act number appear. Speaker's name is shown in the Radio conversation window. In Act 1, Mission 1 “SEMPER FIDELIS”, Added basic gameplay hints. In Act 1, Mission 6 "JUSTITIA CREO", fixed the issue in which the condition for the mission was different when the player was outside of a hanger. In Act 1, Mission 6 “JUSTITIA CREO”, M3, our target for escorting is highlighted with a blue icon. In Act 2, Mission 1"FRAGILE PEACE", fixed the issue in which the Gripen’s attack accuracy was extremely low. Balance tuning for overall missions completed. We listed those missions where we changed the balance significantly. In Act 2, Mission 6 “THE BIRD OF PEACE”, we adjusted the difficulty with a downward adjustment of the HSOAU’s hit points and upward adjustment for offense ability. In Act 2, Misson 9 “TENSHI NO SAIGO Part 2”, we adjusted the difficulty, upward adjustment for boss enemy’s fighting ability. The stage selection function has been added. There are 3 types of maps that can be selected. Once the DLC "RISE MIRAI" is installed, there will be 3 more types added. When the enemies enter the combat area, their positions are now spread wider than before. We remade the in game HUD. The weapon info moves to the lower right of the screen, and boost and ARMOR gauges are displayed in the center. ARMOR value has been changed from percentage to numeric value. The ARMOR value varies depending on the mech, and the ARMOR values for heavy armored mechs are now higher than before. Weapon wheel system has been implemented. When the Bullet Time button is pressed, the weapon wheel is displayed, and detailed information of each weapon and the mech’s status can be confirmed in slow motion. Bullet Time is integrated with the weapon wheel and can be used indefinitely. 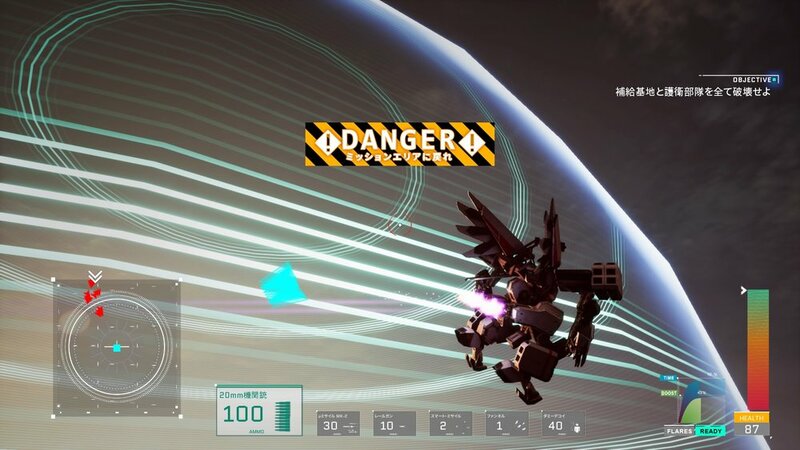 A new 3D radar indicator is added, it shows the direction of the enemy from your mech. It became possible to spot the position of the enemy three-dimensionally. Indicators are color coded according to the target type. The former 2D indicator has been removed. When Boost is low the boost gauge flashes, and an icon is displayed. When Boost is empty, a sound effect sets off to notify the energy outage, and until it recovers the jet effect also disappears. The distance to the enemy is now displayed on the HUD. Also, when reaching lockable distance, the distance is highlighted. Weapons with Multi-Lock-On function can now have its launch timing adjusted. After Multi-Lock-On, release the lock on button and all weapons will be launched at once. Revised the melee attack (Blade) damage to some enemies. Especially for large enemies and boss enemies, you can give greater damage than before with the Blade. The effective range formula has been implemented to each weapon. You can check the range of each weapon on the weapon wheel. We adjusted the balance of each weapon. Damage, accuracy, and damage distance were revised. Weapons with short range now have higher efficiency. The weapon change button has been changed from “left and right” to “up and down” on the directional key. The buttons can be remapped in the option menu as before. Fixed the collision of the combat ships. Implemented “trueSKY" middleware, renewed cloud drawing (does not apply to some maps). You can enjoy battle in thick and high-density clouds. We also revised the lighting of all maps with “trueSKY” technology. Polished and optimized each effect. In addition, we added explosion effects to the ground targets. Some effects were added to the sea. If you glide over the water surface or hit a missile or rail gun, the water splashes. Improved the quality of water reflection in some maps. Improved 3D model of human Mirai. Performance improved. Drastic refactoring of the game code related to battles, for improved frame rate in missions. On PS4 Pro, we can play at an even more stable frame rate. Hint messages shown on the loading screen. In addition, the color of the loading screen now changes according to the progress status of the campaign mode and the mode being played. Text errors have been fixed. Added a function to customize the button settings during the game. After launching the game, select “OPTION”-> Change Button Setting in the main menu. You can use the button remapping function. During the game, as the player approaches the edge of the “mission area,” the mission area is automatically visualized. After launching the game, select “OPTION” in the main menu, then select the system language, subtitle and sound effects of your choice from “Text and Subtitle” and “SOUND EFFECT” menus. Texture flickering, UI animation timing, and other minor bug fixes. Fixed issue that prevented the player from continuing the mission when switching battleframes. In the mission above, edited the way the container gates open. Fixed an issue that caused the trophies 「Ace Pilot」 and 「Welcome to the Circus」 not to unlock properly due to destroyed enemies and fired missiles not being counted under certain conditions. Added option to read the EULA to the main menu. Added option to watch credits to the main menu.